1. Don’t be a pig. Get in the water quickly, but once you’ve swum with him for a few minutes, back off to let the other divers see him from up front. 2. Never grab a tail or ride off their middle fin. They are God’s creatures too, not mopeds. 3. Limit your expectations. Many people have expectations that are way too high, about how they are going to commune with nature and have the most orgasmic experience of their lives. They are convinced if they can have that phenomenal eye-to-eye experience with nature like in The Discovery Channel, then their lives will be more complete, that they can deal better with their cubicle at work, their shallow existences, accept better the bills for their four monster trucks in the driveway. GET OVER IT! Many people get skunked. Don’t give the dive master stink-eye if you don’t find any. 4. 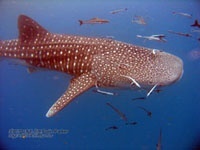 Be extremely careful diving in the open ocean. Watch the boat. Don’t get lost. 5. Don’t get too close. You can get great photos from 10-15 feet away. Don’t hover three feet from his eye trying to photo his conjunctivitis. 6. Be careful of their tails. If you cross over their tail sections you may spook them. That tail makes a hell of a wake; it’ll knock your socks off. 7. Swimming under them may force them to roll over on their back in a defensive maneuver. 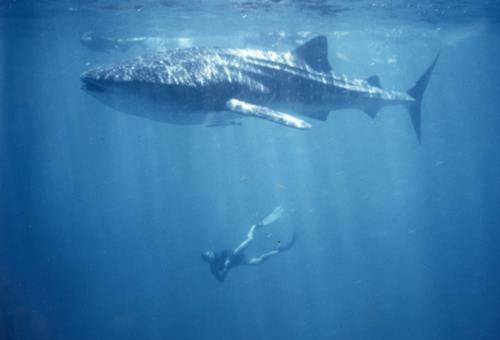 If you are going to swim under them for a look you better be a great freediver and get really deep. 8. If they are staying deep and all the other snorklers can’t keep up, don’t keep doing deep dives on them just cause you are a great breath-held diver. You are spooking him. He won’t come up so everyone else can see him. Don’t be a pig. 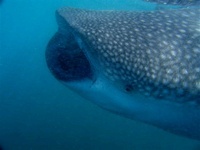 Galapagos, whale shark tail, me.